Anyways, this post is supposed to be about sweet potatoes, not naps and mom wins. And sweet potatoes (although J won't touch them with a 10 foot pole) are the easiest go-to in the Instant Pot ever. Especially if you are trying to figure out what to cook/pack for lunch the next day. Soooo I have a craving to share with you! When I was pregnant with Gabe I had a team that I worked with a lot in Austin so my travel was a lot lighter than most projects. This was great because when we'd get together for all day working sessions, I'd have to order us some lunch and this really let me try some new places near the office that I generally wouldn't try. For example, Jason's Deli. I always feel like I could pack my own sandwich from home if I wanted to eat there (I know, I know... they sell more than just sandwiches and even their sandwiches are better than my packed-lunch-wiches). 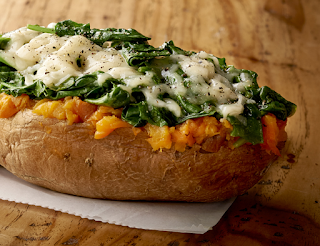 I ordered this sweet potato MANY times and I just can't get enough of it. So today's sweet potato recipe is brought to you by one of my all time pregnancy cravings - Jason's Deli Papa Verde Sweet Potato! I'm just going to be 150% honest here and say that when I make this bad boy, it DOES NOT look that pretty. But it tastes almost just as good! 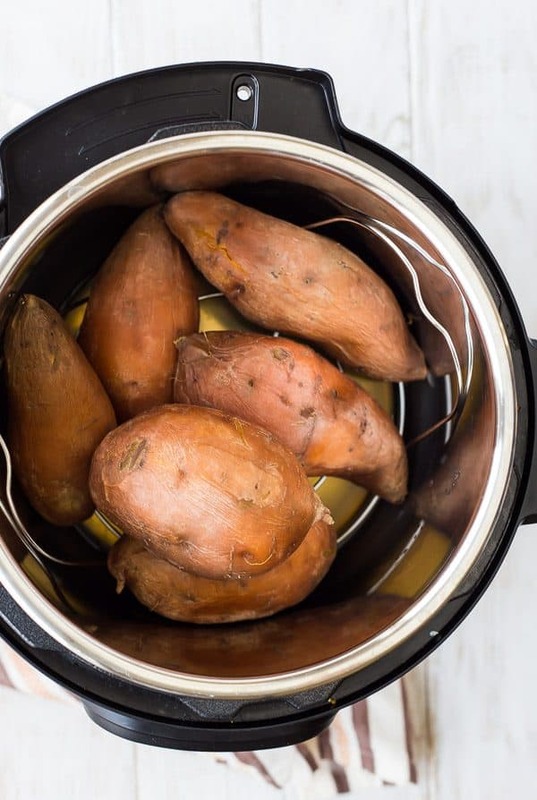 Constructing the sweet potato is definitely more complicated than cooking the potato itself in your Instant Pot. When I do cook something like this, Brad normally calls it "fancy"... but I just like to blend all.the.flavors! And this is great because I usually have all of the ingredients on hand. The potato is as easy as washing it, putting some water into the bottom of the pot, inserting the trivet that comes with the Instant Pot, placing the potato inside and BAM! Cook that bad boy for like 10 minutes. If you want some in-depth potato cooking instructions and tips, A Mindful Mom has a great post on fluffy baked potatoes. While the potato is cooking, I normally saute some spinach with garlic and seasoning. I normally have leftover chicken in the fridge, which I warm up if I am going to eat the potato once I am done making it, but I cut it up while it's still cold if I am going to pack this for lunch the next day (I have a weird thing about not wanting to eat cold food.. cold pizza anyone? not for me). Place trivet in Instant Pot and add 1 cup water. Set on "Pressure Cooke" program and set time for 12 minutes. When finished cooking, don't open lid. Allow pressure to reduce naturally, about 8-10 minutes.